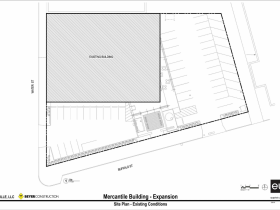 Proposed Expansion. Rendering by Eppstein Uhen Architects. 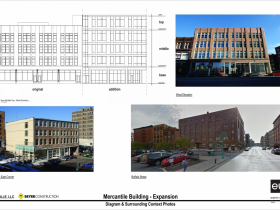 A proposal by developer Tim Dodge to expand the Mercantile Building, 318 N. Water St., with a five-story office and retail expansion into a parking lot to the south received unanimous conceptual approval Wednesday, March 9th, from the Business Improvement District No. 2 Architectural Review Board [ARB]. 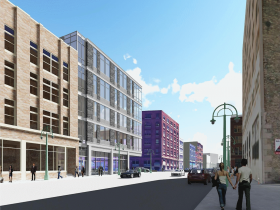 The plans were presented by T. J. Morley and Troy Jacoby of Eppstein Uhen Architects in a slide show in the darkened offices of the Historic Third Ward Association, 219 N. Milwaukee St. Ald. Bob Bauman, the Chairman of the ARB, sat at the head of the table as the presentation unfolded in a series of building elevations and perspective shots of the proposed 35,000-square-foot structure. 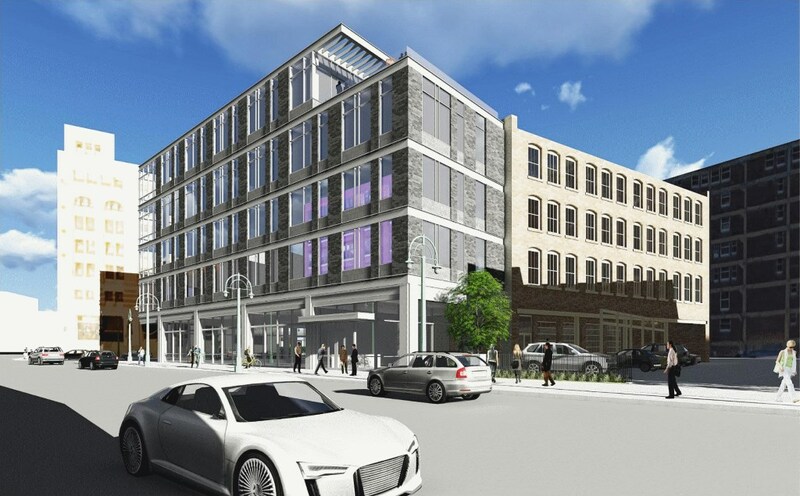 It would be built immediately to the south of the existing building where a somewhat landscaped parking area is now located on the northwest corner of N. Water and E. Buffalo streets. 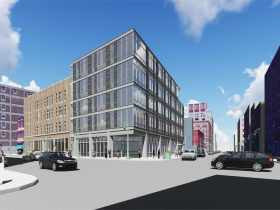 The structure would connect to the existing 50,000 square foot 4-story 1909 warehouse building to the north that houses the Hanson Dodge Creative firm of which Tim Dodge is a principal. He is also the principal of Graceville, LLC, which owns the property and which will be the developer of the project. Beyer Construction will build it. Dodge told the group he was a developer by opportunity, and not by inclination or profession, but thought he could take a stab at developing the property. Among other things, it would enable him to more efficiently organize the staff needs at Hanson Dodge. The marketing firm is big in the sustainable/active lifestyle market, and has had a 25-year relationship with Trek bicycles. That’s longer than Lance Armstrong lasted with the Burke family’s cycling company. 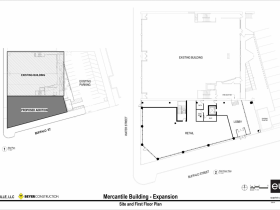 The existing building has a footprint of only 12,500 square feet, leaving 18,655 square feet of vacant land on the 31,155 square foot property. The total land assessment is $934,700, or $30 per square foot. The undeveloped portions, including a parking lot to the east that is not part of the projected expansion, but could be the site of a parking structure, is assessed at $559,650. Taxes on the vacant land alone amount to $16,412 per year. 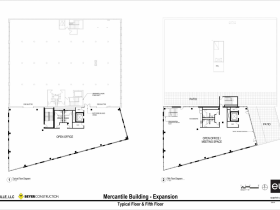 The total assessment for the property, which includes the existing building valued at $3,091,300, is $4,026,000. The 2015 tax on the property was $125,468, paid on the installment plan. Dodge says that by the time the project is finished, in one year, the market will be robust enough to guarantee a good return on his investment, the financing of which is pending. 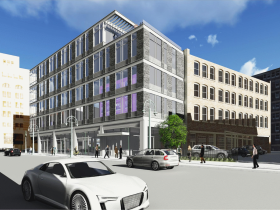 The proposed structure will be glassy, which is not the predominant material in this 1890s warehouse district. 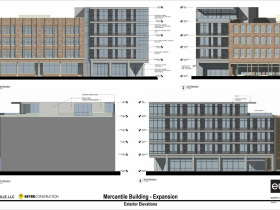 However, like the vast majority of the buildings in the Historic Third Ward, it will be built to the lot line to the approximate height of its neighbors, and will have a facade regularly divided into articulated segments. 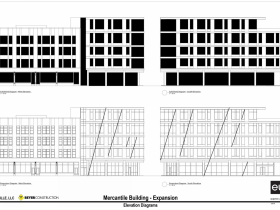 The Historic Third Ward guidelines also caution against new buildings masquerading as old ones, and this proposal meets that test. Those are two critical elements of the ARB design guidelines for the Third Ward, and architects know to make their plans accordingly. What remains is the tweaking of some details, and decisions on finishes and materials. Some sample building panels met with general approval by the board members. Some reservations were expressed about how the bays of the building would be ordered, and what sort of rhythm would be expressed in the facade. There was also some concern that the building, although it has a clearly articulated base and middle, lacks a defining feature at the top. These are things that the architects will work on prior to their next appearance with the board at which it will ask for approval. What a great complement to the Merchantile Building. Very nice. Dr. George Palermo died 2-23-2017 LasVagas, BoneCancer. He was the Dr. for Jeff Domer.